There's no better way to see The Peg, than looking sweet, upon the seat, of a bicycle built for two. Heck, you could even double up that fun and make it a bicycle built for four; because when you are cruising with Bee2Gether Bikes, you (and your crew) are doing so in style. With locations conveniently located at two of Winnipeg's biggest attractions -- that being The Forks and Assiniboine Park (along with another operation outside the city at Bird's Hill Park), their yellow boler trailers and fleet of fun pedal-powered vehicles are ready to send you and your crew off on your merry way. Bee2Gether has one sweet fleet, which includes a wide selection of tandems (as pictured above), single person step-through bikes, two person side car trikes and carts, along with three and four seated cart bikes. They even have a six-seater Limousine Surrey that you could transport the better part of a party in. Here at Tourism Winnipeg, Bee2Gether have become personal favourites when it comes to showing travel writers and local celebs the city. 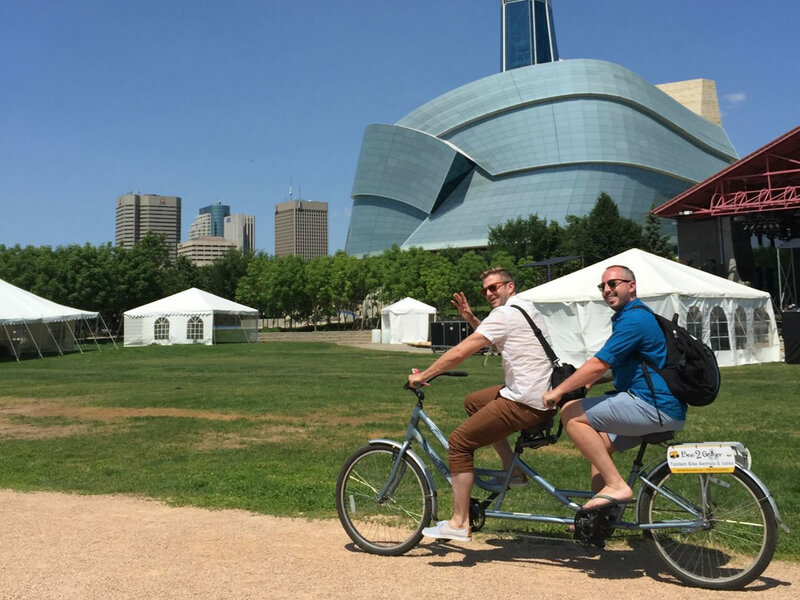 We've taken a group of radio DJ's on a food truck tour last summer down Broadway (which you can read more about here), while just the other day we did a full tour of downtown and St. Boniface with a writer upon one of these two-wheeled, two-seated chariots. From their Forks location, you can easily explore this 56 acre area that is filled with restaurant and pub patios, art galleries, public art displays, and Cool Gardens. From there, a quick pedal over the architectural darling -- the Esplanade Riel pedestrian bridge -- will put you right in the heart of St. Boniface, Winnipeg's French Quarter. Bee2Gether's location at Assiniboine Park makes it easy for your and your crew to cover the Park's ample greenspace (400 acres of which are an English-style landscape) along with the sculpture gardens and hidden attractions. It makes for a peachy afternoon with the wind blowing in your hair as you head around tree arched paths and open fields. Rental rates from Bee2Gether vary from vehicle to vehicle (so check here), and are available from a half hour to a full day. You can also get special group rates when you rent three or more bikes. They are open seven days a week in the summer, from 11 a.m. to 9 p.m., and you can reserve your ride by calling 204.298.2925. Should you want to go it alone when it comes to cycling the city, we also recommend you check out White Pine Bicycle Co., which is located at The Forks at 25 Forks Market Road (inside the Johnston Terminal). These folks specialize in gorgeous cruisers, and their bike shop does more than just rentals, with bikes for purchase (they can even custom build you an absolute beauty), a shop that can tune-up your ride, and countless cool accessories. White Pine is also now doing featured tours that will introduce tourists and locals alike to interesting parts of the city. Every Tuesday, for a mere $25, you can go on a Little Bike on the Prairie Tour where lovely nature routes through Assiniboine Park, FortWhyte Alive, and other forested areas are all on the agenda. Other tours include a St. Boniface Tour, a Downtown Winnipeg Tour, a tour through the Exchange with guides from the Exchange District Biz, and a mural tour with the folks from West End Biz. All of these tours are just $25 -- get the full schedule here. You can give White Pine a shout and book your bike, tour, or both, today at 204.615.0050.